After leaking details to the Mail on Sunday in 1997, he fled to Utrecht in the Netherlands and later France, where he spent two years from 1998 to 2000 living in Boulevard Voltaire, where the Bataclan Theatre – the scene of the worst atrocity of the day took place, according to his video. 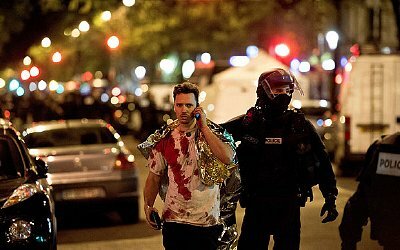 He said: “I think there is some dark design in the pattern of the attacks that took place in Paris on Friday, November 13. Before dismissing Shayler for referring to himself as the ‘Christ’ it should be noted that in some esoteric writings it has been written that Christ would indeed return at this time but not in physical form but in spirit. In other words ‘Christ’ would manifest as an inspirational force rather than a physical entity. Is this why Shayler is making such statements? Is he actually trying to fathom the truth of what happened in Paris in November in his own, confused way? We reserve judgement but Shayler’s comments should only add to growing doubts to the official version of events in Paris in November. Ed.